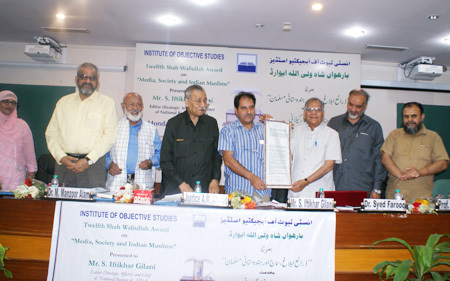 The Twelfth Shah Waliullah Award on “Media, Society and Indian Muslims” was presented to Syed Iftikhar Gilani, editor (strategic affairs) and chief of national bureau of DNA by Justice AM Ahmadi, former Chief Justice of India at a function organised by the Institute of Objective Studies (IOS) on April 3, 2017 at the conference hall, FTK Centre for Information Technology, Jamia Millia Islamia, New Delhi. The award carries a cheque of Rs. 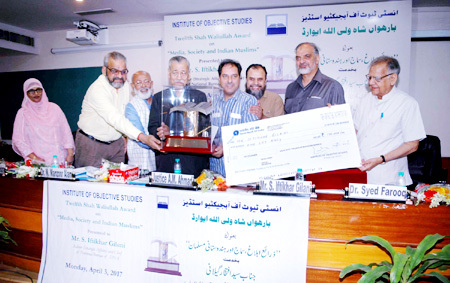 1 lakh, presented by Dr. Syed Farooq, President, Tasmia Educational Foundation, and a scroll of honour was presented by Prof. ZM Khan, Secretary General, IOS. The award instituted by the IOS is given every year to a person whose contribution to a selected field is worthy of recognition. 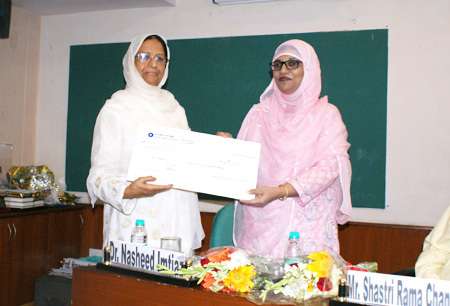 Prof. Haseena Hashia, a member of the governing council, IOS, presented a cheque for Rs. 25,000, and a certificate, as prize for the best essay to Dr. Nasheed Imtiaz, asstt. professor, Deptt. of Psychology, AMU, Aligarh. 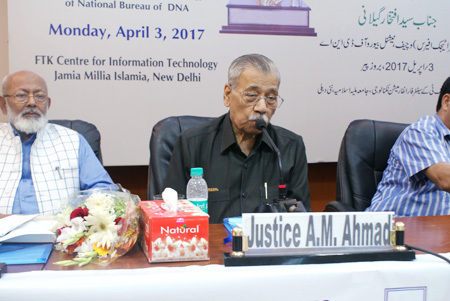 The occasion was also marked by the release of senior journalist and correspondent of the Voice of America (Urdu) Suhail Anjum’s book Dini Rasayel ki Sahafati Khidmaat (Journalistic Contribution of Religious Journals) by Justice Ahmadi. Presiding over the function, Justice Ahmadi underlined the importance of Article 32 of the Constitution. This Article guarantees the enforceability of Fundamental Rights. The Article also provides the mechanism to enforce these rights. The scope of Article 21 was expanded by the Supreme Court to stipulate that life must be worth living. Freedom of speech did not explicitly provide for freedom of press, but the interpretation of Article 19 made it clear that such freedom was inherent. 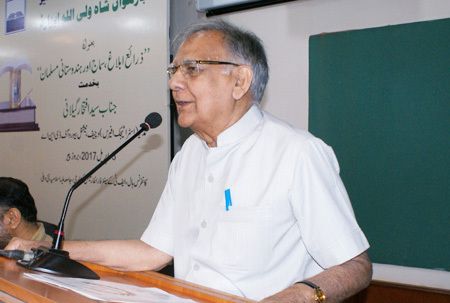 Describing the Indian Constitution as a wonderful document, he opined that a reading of the Constituent Assembly debates dispelled several misconstruals about the intention of the Constitution. He said that both his lawyer son and lawyer daughter read the Constituent Assembly debates everyday for half an hour before going to bed in order to understand the true spirit of the Constitution. He was dismayed that even 50 years after the Supreme Court’s directive for free and compulsory education to 6-14 year age group, no headway had been made so far. Terming it as a serious matter needing urgent attention, he said enough number of schools should be opened with required number of teachers. Commenting on the political environment in the country, Justice Ahmadi said that only one party was ruling almost the entire country. Opposition parties were not welcome in the prevailing situation. Shouting brigades had become law unto themselves and democracy was in dire straits. This was not the democracy that the framers of the Constitution had envisaged. He noted that democracy meant opportunity to everybody and it was up to us to decide which form of democracy we wanted. He advised Gilani to freely express his views on the current political situation of the country. At a time when democratic institutions had lost the voice of reason, it was the duty of the media to highlight the perils looming large over the polity. Thus independent and bold voices were required to forestall any attempt at gagging the press. Comparing the present press with that in the past, he said that articles contributed by secular writers were hardly seen today. Newspapers in general avoided carrying well-meaning articles. This trend did not augur well for democracy, he added. 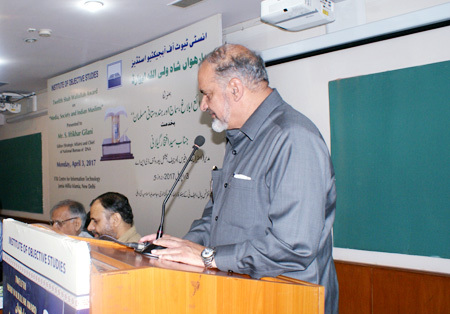 Dr. S. Farooq briefly threw light on the contribution of Shah Waliullah to the study of the Quran and Hadith. Shah Sahib was the first to translate the Quran into Persian. 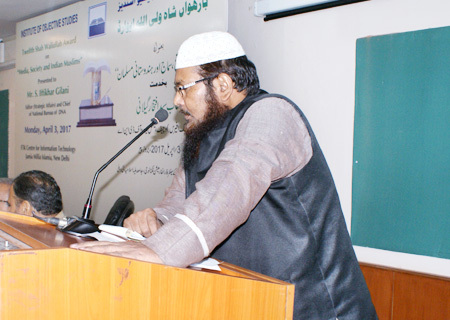 He also prepared a syllabus for students of the Quran, Hadith and Islamic jurisprudence. Dr. Farooq lauded Iftikhar Gilani for his bold and objective reporting. 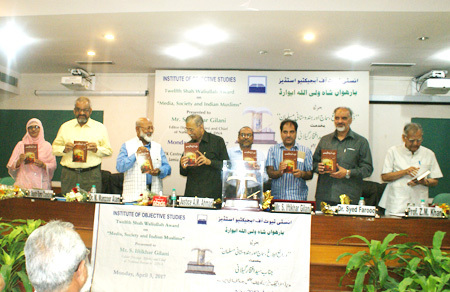 He especially referred to the Urdu translation of Gilani’s book My Days in Prison, which fetched him Sahitya Akademi Award. Syed Iftikhar Gilani observed that the lack of achievement of Muslims today was due to a lack of communication with the majority community. “We have failed to outreach to our neighbours. This lack of interaction with others has resulted in several misconceptions about us, which have never been dispelled”, he remarked. He observed that Prophet Muhammad (PBUH) was the best communicator whose word traversed through several continents. Explaining the under-representation of Muslims in All India Services like IAS and IPS, he said that as of now it stood at a bare 3 percent. However, it was because only 3 percent of the candidates for it were Muslims. More of them should opt for it, he advised. Communication with others was the best way to explain so many things to them and get closer in order to understand them. This also explained why prophets were ordained to visit Palestine to spread the message of Allah to the world since it was a country most suitably located for the message to be communicated to other parts of the world. 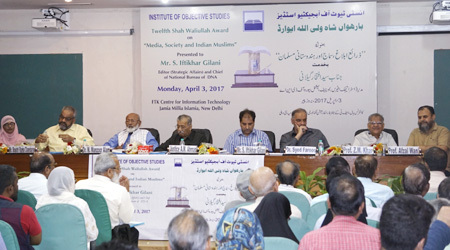 While underlining the need for education among Muslims, Gilani pleaded that more and more Muslims should take up journalism as a profession. He said he was feeling alone in his profession as the number of Muslims in it was almost negligible. He urged the Chairman IOS to continue his engagement with the Muslim youths for accepting the challenges confronting the community. 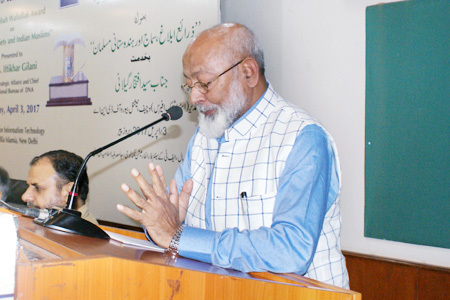 Eminent journalist and former editor of the English daily Tribune, Shastri Rama Chandran, speaking as the guest of honour, described the Indian Muslims as a unique people in the world. This was due to the diversity of living, habits and their adjustment to conditions in which they lived. Praising Iftikhar Gilani for his reporting, he said that he carved out a name for himself with his efforts. He earned acclaim worldwide for his work and found a place among those whose forte was categorised as rare. An award, he said, was an institutional memory and an outcome of life for a person who received it. Expressing concern over the vanishing trend of the traditional media, he said that WhatsApp, Twitter, Facebook and television were writing an epitaph on the demise of the media. Today, media was defined by technology and not by content. Media was being manipulated and the participation of public life was abysmally shrinking. Media was not participatory, though it was expanding. He maintained that fake media was the outcome of the Internet which was constantly doing harm to society. Social media had caused the demise of newspapers. He expressed the confidence that the IOS would channelise finer minds to think over ways of preserving the memory of the written word for coming generations. 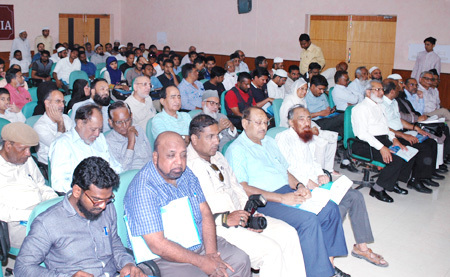 IOS Chairman Dr. M. Manzoor Alam assured the gathering that the suggestion of Shastri Rama Chandran would be given active consideration. He was happy that the function was attended by a number of serious journalists. He reiterated his belief that sitting, thinking and working together was necessary for the survival of society. He appreciated Gilani for his writings that had concern for humanity, including Muslims. He announced that the IOS would institute three to four scholarships for students of journalism. 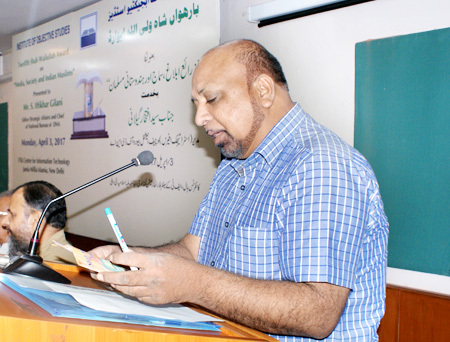 IOS Secretary General Prof. ZM Khan highlighted the activities of the Institute. He said that the Institute was engaged in the study of the contribution of Islam to the march of civilisation. It was also focusing on marginalised sections of society. Besides, the Institute encouraged research in various areas by financing projects undertaken by scholars. It also awarded scholarship to students studying in Jamia Millia Islamia, AMU, Patna University and other universities of the country. 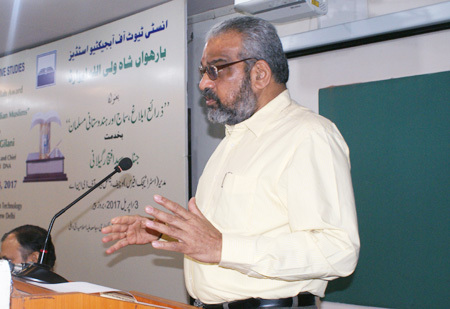 In order to understand others’ views, the Institute had started a translation programme under which a number of books on various topics had been translated so far. Publication of books was another area in which the Institute was engaged and more than 400 titles had come out, he concluded. 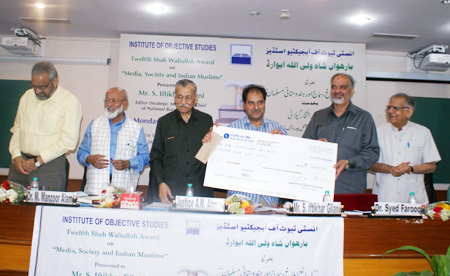 Member-Secretary of the Board administering the award and Finance Secretary, IOS, Prof. Ishtiyaque Danish spoke on Shah Waliullah and the award instituted in his name. 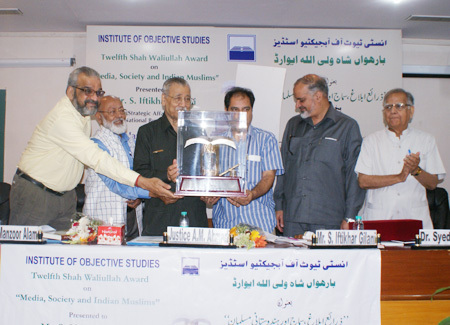 Started in 1999, the Shah Waliullah Award had been given to 11 personalities so far in recognition of their services in different areas, he said. 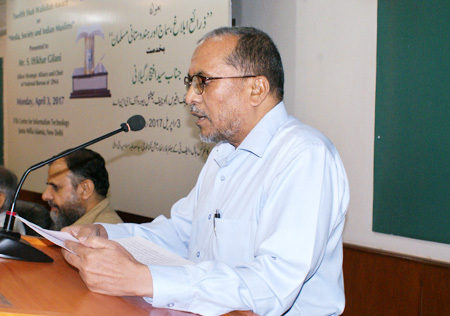 He informed that the 13th Shah Waliullah Award would be given on “Islam and Political Science”, while the topic for the essay writing competition would be “Political System in Islam: Relevance to Modern Time”. 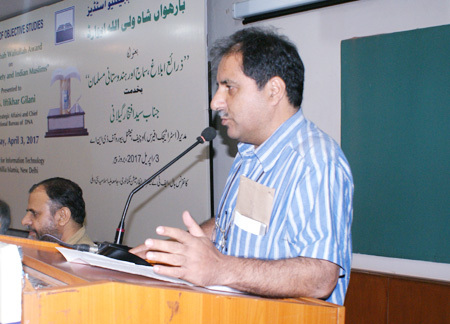 Sohail Anjum presented the profile of Syed Iftikhar Gilani in Urdu. SM Shafiq read out the scroll of honour. Prof. Afzal Wani, Asstt. Secretary General of the IOS, conducted the proceedings. 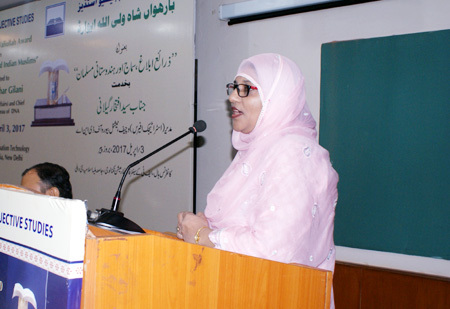 Dr. Nasheed Imtiaz expressed her gratitude for getting the prize for the best essay. 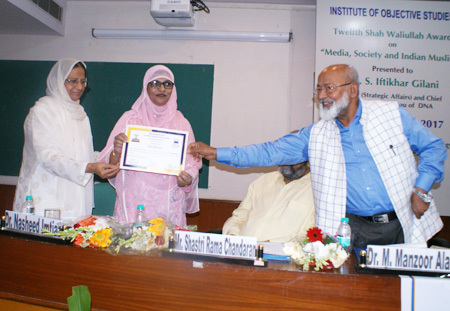 She also thanked the IOS for awarding a fellowship to her for Ph.D.
Maulana Abdul Hameed Nomani presented a review of the book Deeni Rasail ki Sahafati Khidmaat published by the IOS. Earlier, the function began with the recitation of a verse from the holy Quran by the in-charge of the Urdu Section, IOS, Maulana Ajmal Farooq. 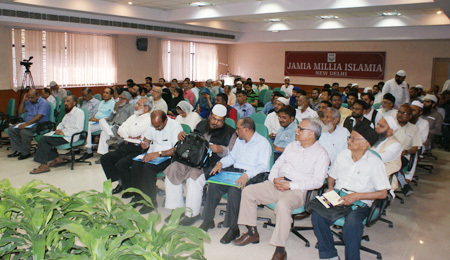 The function was attended by a number of scholars, university teachers, researchers, journalists and prominent citizens.